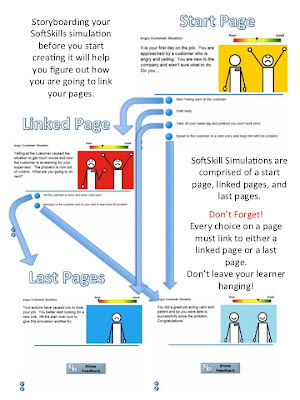 Incorporating SoftSkills pages into your ProForm course is a great way to give your learners a chance to practice their skills in a simulation. Learners will be faced with a scenario, often with accompanying images and audio, and have to make a decision based on the options they are given. The choices that learners make will award (or deduct) points from their score and result in different subsequent scenarios and conclusions. At the end of simulation, learners can view all the choices that they made and receive feedback on each, as well as seeing the points earned for each choice and their final score. Start Page: Every simulation will have ONE of these pages. 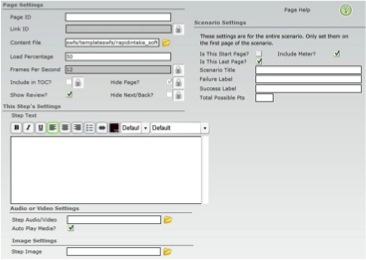 There are up to four choices on the start page that will link the learner to additional pages. 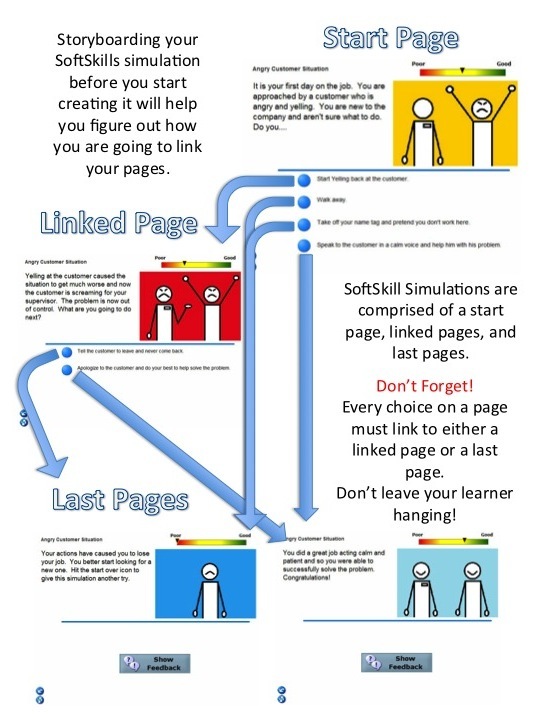 Linked Pages: The amount of "linked pages" in your simulation depends on you! This is the page type that each of the four choices from the start page will go to. Every choice must lead to a "linked page" or a "last page." Last Pages: Any time you wish to put an end to a string of choices, a "last page" must be used. This page type will end the simulation, give the learner feedback, and allow the learner to continue on to the rest of the course. The image below is an example of a start page. The image below is an example of a linked page. There are only two choices on this page, but you can have up to four. The image below is an example of a last page. Page ID: This Page ID needs to be typed in on the corresponding choice tab that leads to this page. Content File: Do not change. Include in TOC? : Uncheck this box. Show Review? : Uncheck this box. Hide Page? : Check this box. This will ensure that the page does not appear in the table of contents. Hide Next/Back? : Check this box. Step Text: Type in the text that you want the learner to read. Step Audio/video: Optional. Click on the folder icon to browse for the file you want to use. Step Image: Optional. Click on the folder icon to browse for the file you want to use. Is This Start Page: Uncheck this box since it is not the first page of your simulation. Is This Last Page: Uncheck this box since it is not the last page of your simulation. Include Meter? : Check this box if you want your learner to see the meter that rates their responses. Total Possible Pts: Leave blank. Choice 1-4 Tabs: Fill out up to four choice tabs that will lead your learner to even more pages. Show Review? : Check this box. At this point the learner will receive a score and feedback for all the choices made during the simulation. Hide Next/Back? : Uncheck this box. After completing the simulation, the learner will will click on the “Next” button to take them to the next part of the course. Is This Last Page: Check this box since it is not the last page of your simulation. Your simulation is now complete!